I've been in Scandinavia and Vietnam this year and have not bothered to get a SIM card for my phone -- WiFi was available wherever I went. Let me start with a look at today's Cuban WiFi, then turn to the question of portable and mobile connectivity in the long run. The users are young people. They are often communicating with family and friends outside of Cuba. My guess is that a lot of that communication is paid for by those outsiders. The content, like that of the weekly paquete, is apolitical. IMO seems to be a popular program for audio and video chat. People are using the hotspots a lot at night when it is cool. There are long lines for 2 CUC (a little less than $2) scratch-off cards that enable one to log on for one hour and Miroff says sidewalk entrepreneurs are hoarding and re-selling them for 3 CUC with impunity. Yoandy Sánchez has an even better idea -- send an SMS message that costs 2 CUC to an ETECSA phone number that responds with a 1-hour passcode. (A hidden cost of obsolete technology is that it "blinds" developers). Miroff also says people are using Connectify Hotspot to share access to a single connection, at reduced speed, for 1 CUC per hour. He also says ever-resourceful Cuban hackers are tapping into street lamp electrical wires to create charging stations. The hotspots are supposed to provide 1 mbps connectivity to all users who are logged in, but that is not always the case. Still, people are doing video chats and streaming lo-res video. (Miroff was able to watch ESPN highlights). Even at 2 CUC per hour, there is a lot of pent-up demand for Internet access. People are willing to wait to get online. Getting online at one of these hotspots is something of a party/social event. Cuba also has conventional Internet access rooms with PCs, but these WiFi spots allow people to bring their own devices so the cost to ETECSA is much less and they do not have to worry about equipment becoming obsolete. They are using Huawei WiFi equipment (and are also using Huawei gear for home DSL). Let's keep this WiFi rollout in perspective -- 35 oversubscribed hotspots for 11 million people is a drop in the bucket. What are they doing for backhaul at the 35 hotspots? How are they managing bandwidth to give each user 1 mbps? Are Huawei engineers building the network or is Huawei merely a vendor, with Cubans doing the engineering and installation? (I hope it is the latter). Are the talents of Cuba's homegrown WiFi connectivity experts being used? Are the Chinese financing the rollout and, if so, what are the terms? Is the Cuban government surveilling the users? Which IP addresses are blocked? Are the Chinese supplying equipment, software or expertise for surveillance and content filtering? How fast are they planning to extend WiFi access? OK -- that is today, but what about the future? I've been in Scandinavia and Vietnam this year and have not bothered to get a SIM card for my phone -- WiFi was available wherever I went. In the US, WiFi access is providing competition for the cellular network, cable companies are creating public hotspots using home and commercial routers for backhaul and Fon is doing the same in Europe. 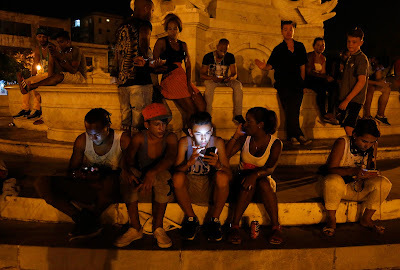 The US and Europe have robust fourth generation cellular networks with near ubiquitous backhaul and radio coverage, but nearly all Cuban cellular connectivity is second generation. 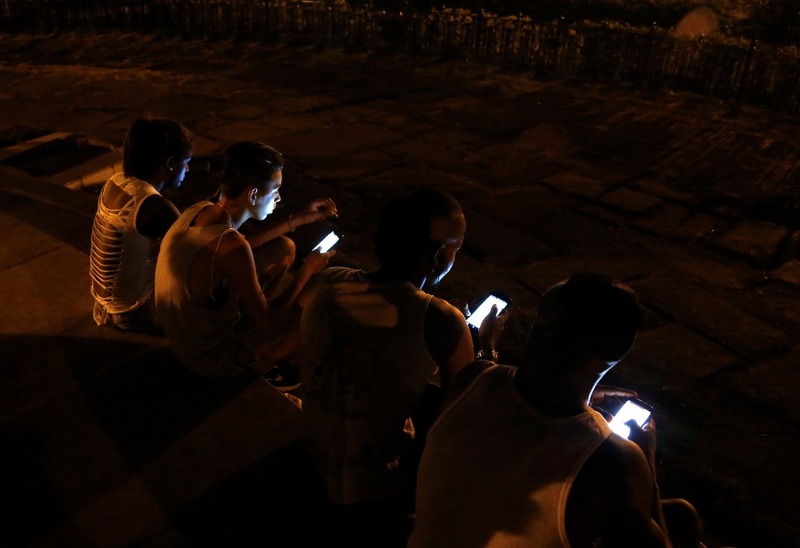 In an earlier post, I suggested that Cuba forgo short term cellular connectivity. Can they substitute WiFi in the interim? Speaking at the 10th Congress of the Young Communist League of Cuba, Deputy Minister of Communications Jose Luis Perdomo hinted that that might be their strategy. 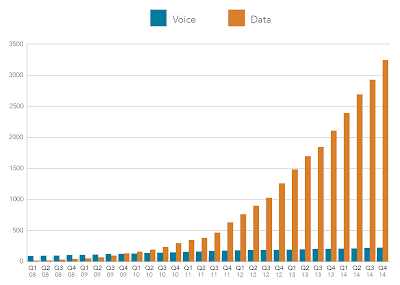 The following graph from Akami's State of the Internet report shows total (upload and download) global monthly mobile voice and data as measured by Ericsson (PetaBytes per month). 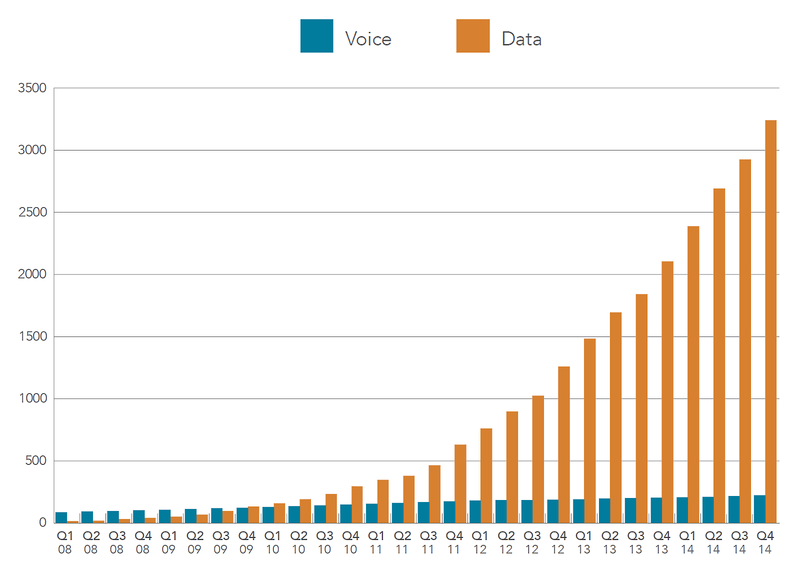 Voice calls are rapidly diminishing as a percentage of mobile data. By 2020, applications like IMO, Skype, WhatsApp and Google Hangouts will have rendered the distinction between voice and data meaningless -- it's all bits. 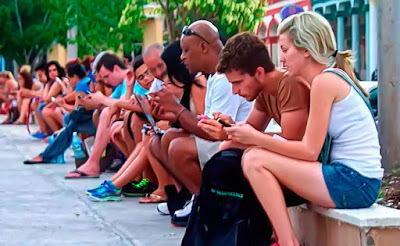 In five years, the Cuban economy will probably be stronger, the embargo will probably be history and we will know the cost and performance of 5G cellular, 2020 WiFi and other wireless equipment. Can Cuba get by with 2G phone service and expanded WiFi access until that time? Internet geeks have a saying: "IP everywhere" (even over carrier pigeon). Cuba might become the first "IPv6 everywhere" nation. 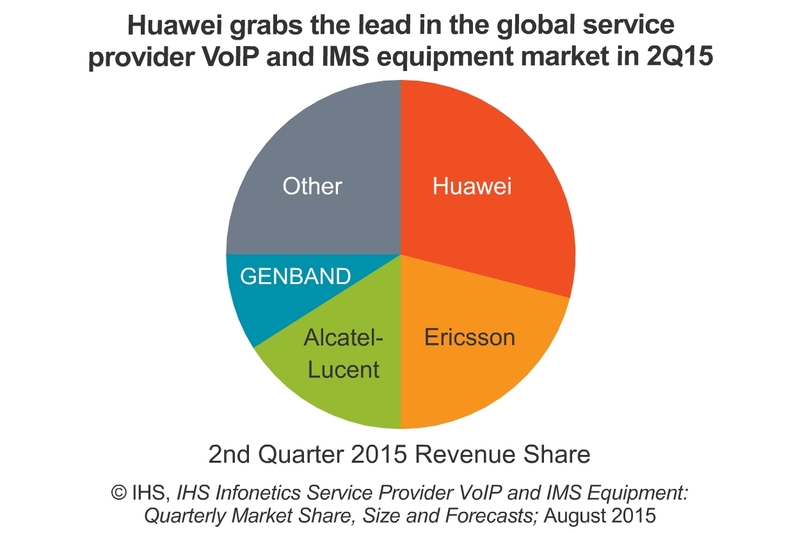 The market research firm IHS reports that Voice over IP (VoIP) and IP Multimedia Subsystem (IMS) equipment sales to carriers are up by 46% over the second quarter of 2014 and Huawei is the leading supplier of the equipment. Calls using VoIP, like Skype or Google Voice, have been competing with circuit switched calls for many years -- making their "best effort" to deliver high quality. At times, the quality was not as good as circuit switched calls, but IMS calls use more complex protocols to deliver superior quality. The fact that sales of VoIP and IMS equipment to "cell phone" operators are growing rapidly foreshadows the increased substitution of "data" for "voice" suggests that Cuba may forget about circuit-switched calling going forward. They need LTE to bring their economy up to speed. It's proven that there is a direct positive correlation between broadband infrastructure and economic growth. I'm sure some investors will pop up; someone will raise the money to build the network. Regardless, Cuba is no longer expanding the current 2G network -- the covered population has remained constant for two years. 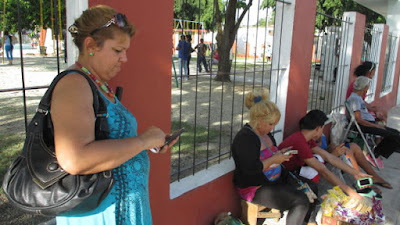 Reader Hédel Nuñez Bolívar shared the news that Connectify is happy to give their software to Cubans sharing WiFi links. They are sharing 1 mbps links, so it will be slow, but better than nothing. La avidez de los cubanos por navegar por la red ha hecho que se produzcan unas 55 000 conexiones en cada uno de los 35 puntos de wifi repartidos por la isla, y de ellas 8.000 de forma simultánea, según datos oficiales. I've searched the ETECSA and Granma Web sites and cannot find the "official source" of these figures; furthermore, I cannot figure our what they are claiming. Are they saying that an average of 55,000 2 CUC ticket sales have been made at each hotspot around the island since they began service? Are they saying a single hotspot can support 8,000 simultaneous connections per day??? Does anyone know what the official source of this data is and what they are actually claiming? The hype continues. People living outside of Cuba can now purchase WiFi access for Cubans using the "top off" service, Ding.com. The recipient must have a Nauta account and the cost is 10 CUC for five hours of WiFi access. If it is possible to receive multiple five-hour contributions, Cuban "bisneros" may use them to stock up on hours. ETECSA has opened eight new WiFi hotspots and plans to open 12 more by the end of the year. The new hotspots are in parks in the provinces of Pinar del Rio, Cienfuegos, Ciego de Avila, Las Tunas, Matanzas, Villa Clara and Mayabeque, as well as a square in Sancti Spiritus. This is consistent with Cuba's historic emphasis on geographically spread connectivity (relative to other nations at their state of Internet development). Four new WiFi access hotspots have been opened. My guess is that this slow rate of implementation is due to lack of backhaul, but that is just a guess. It would be interesting to know the utilization rates and financial returns for the hotspots. A woman interviewed at the new Holguín hotspot, shown below, said she welcomed the hotspot, but would only come there during the day for fear of crime. Holguín WiFi access hotspot -- standing room only. 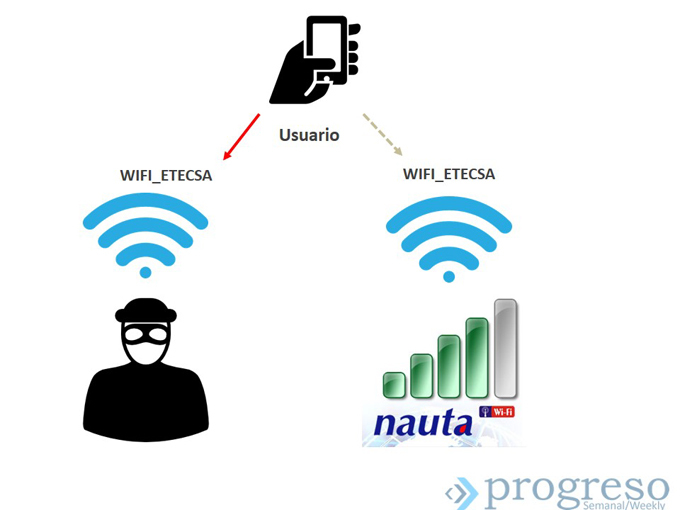 Spokesmen from ETECSA and the "Grupo Nacional de Conectividad Wifi" were interviewed about the WiFi access points. They said the access points have 2.4 GHz 5 GHz channels and there may be up to 30 1-Mbps users on each. But, shouldn't the 5 GHz channel be faster and shouldn't the 2.4 GHz channel carry further? Does a user select a frequency when connecting or is that automatic? They also blamed poor performance on users who download videos or share their connection using Connectify (see above), sounding a bit like our mobile carriers when they speak of "bandwidth hogs." 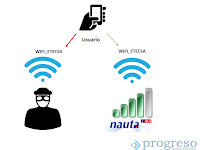 A final question -- what is Grupo Nacional de Conectividad Wifi? A second vendor, Habla Cuba, is now offering Nauta WiFi recharging online. I wonder how much revenue ETECSA earns from foreign purchase of telephone and WiFi access minutes. Havana Times reports on incidents of hacking at ETECSA hotspots. Hackers create sites that look like the ETECSA login page and when a user tries to log in, the spoofed site records their user name and password, then displays an error message. This spoof is credible because ETECSA service is unreliable, so users are not surprised by system errors. Hackers are also using "man in the middle" attacks -- capturing information that flows between the user and the Internet. Since Cuba surveils Internet usage, a user might lose more than his or her prepaid access time -- a hacker could do things that would attract the attention of the authorities. Users are advised to keep track of the number of minutes they have in their account and to avoid logging on if there is a laptop nearby, but complaining to ETECSA after being hacked is pointless because they do not assume responsibility for hacks. They need to hire a security consultant. "Not to mention the email service. You can sit and watch the icon refreshing for half an hour without any emails coming in, using up all of your credit. It’s mind-baffling and abusive." The post ends with seven sarcastic questions for ETECSA. Based on this, it seems that the service has not improved and it remains far worse than what we think of as WiFi Internet access in other nations. It also makes ETECSA's claim that 35% of the population are Internet users meaningless. ETECSA has cut the price of its internet service by an average of 25 percent and announced a new prepay offer. National internet access now costs USD 0.25 an hour while international access has been cut to USD 1.5. The new prepay bundle includes 5MB of data for USD 1.5, to be used within 30 days, but, unused capacity may be rolled over if the user renews for the following month. This is a big gain for Cubans, but still extremely expensive and slow and inconvenient.